76550 - Edelbrock Hose Fitting - MiataRoadster - Stay tuned with MiataRoadster! Manufactured by Russell, our wide variety of lightweight aluminum, stainless and brass adapter fittings allow for the connection of Russell nitrous hose ends to almost any component. Use the AN size that matches your hose and the NPT (National Pipe Thread) size that matches the component you are plumbing. These fittings are Precision machined to ensure precise thread engagement for a proper connection. 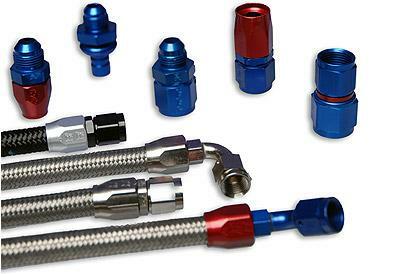 Lightweight fittings match up with all Russell performance hose and hose ends. Custom nitrous plumbing with Edelbrock/Russell Performance parts becomes a breeze.